Ho-ho-ho! Time for another giveaway! This time it's sponsored by our lovely friends from Absynthe Beauty! 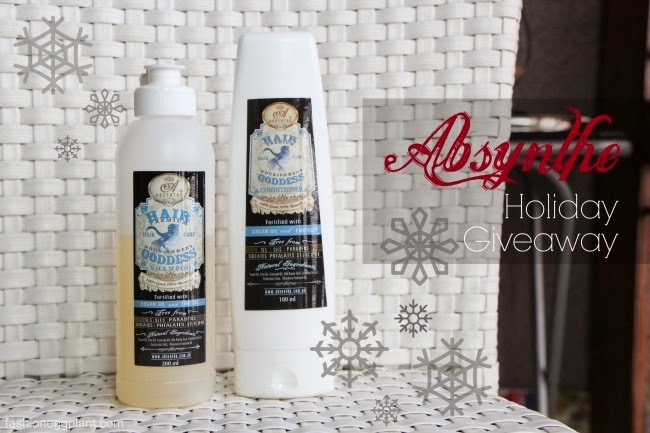 5 lucky Fashion Eggplant readers get to win 1 Hair Goddess Shampoo and 2 Hair Goddess Conditioners. Both are infused with Argan Oil to restore your hair's luster and shine. It also repairs hair damage and helps reduce hair fall. Been using this for awhile now, (hence the photo of the half-filled shampoo bottle...sorry about that :P) and I love it. It's gentle enough to use everyday on myself and my little girl plus it keeps my color-treated hair soft and manageable.